There are a few common controls throughout Rival IQ, including ones for date ranges, tag filtering, and export. The following features help you get oriented with filtering and diving in and out of data within Rival IQ. Settings Bar - The black bar at the top of the screen helps you configure and filter the data on your screen. You can choose the social channels you are focused on, the companies you want to include, and the date range you want to view. Tooltips - Throughout the pages, panels, and reports in Rival IQ, hover over the information bubbles to dig into metric definitions, calculations, and how to go deeper on any displayed data. Company Links - All company names in Rival IQ are hyperlinked so you can click to view more information about any company on its Company Profile page. View More - Throughout the panels in Rival IQ, there are “View More” buttons to help you expand on the data set you’re examining. Row Clicks - Any row that hovers to blue is clickable. 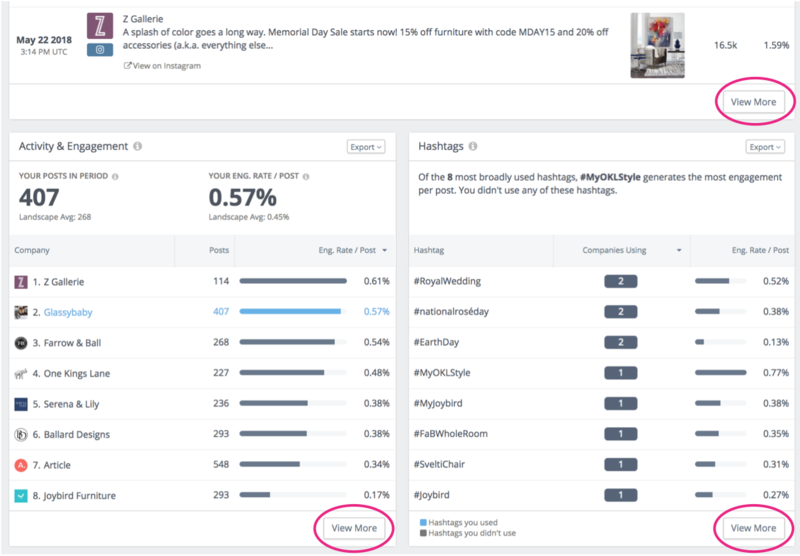 Click on a row to view a modal of social posts related to that row. In this example, clicking on the "#GIVEAWAY" row will show you a posts using that hashtag. Manage Columns - On the top right of some panels, the “Manage Columns” buttons let you add or remove columns. Export - In the top right corner of dashboards and panels, the export button lets you create a visual report in ppt, png, pdf, and csv formats. You can also schedule reports in any cadence you choose and add other recipients to a report.